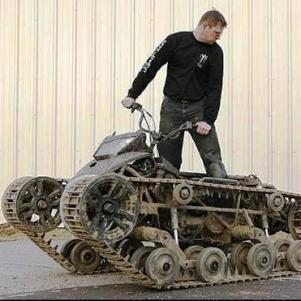 The Howe & Howe Mini Ripsaw is what happens when you put an ATV on tank tracks. This tankcycle achieves top speeds of upto 40 mph with its 85hp four-cylinder engine. The body is taken from a ’09 Polaris Sportsman 850XP, while the tracks were manufactured by Howe and Howe themselves.